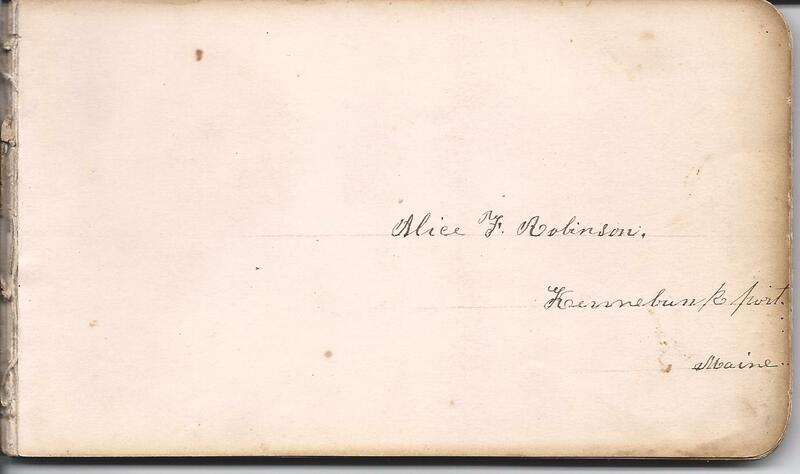 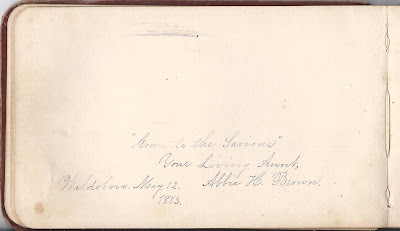 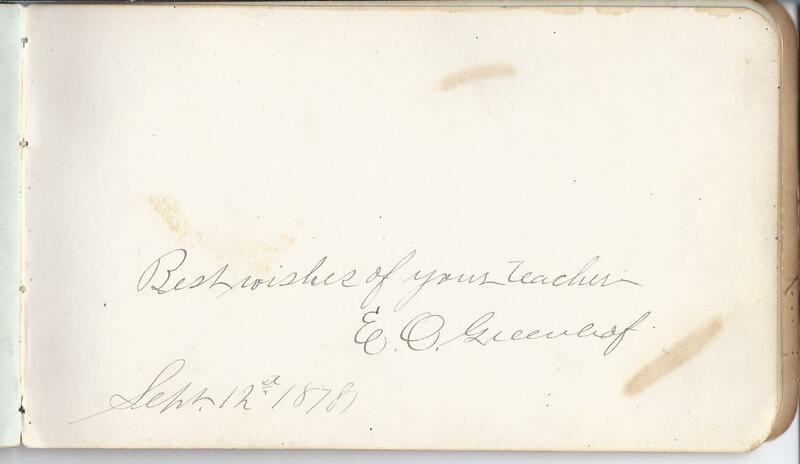 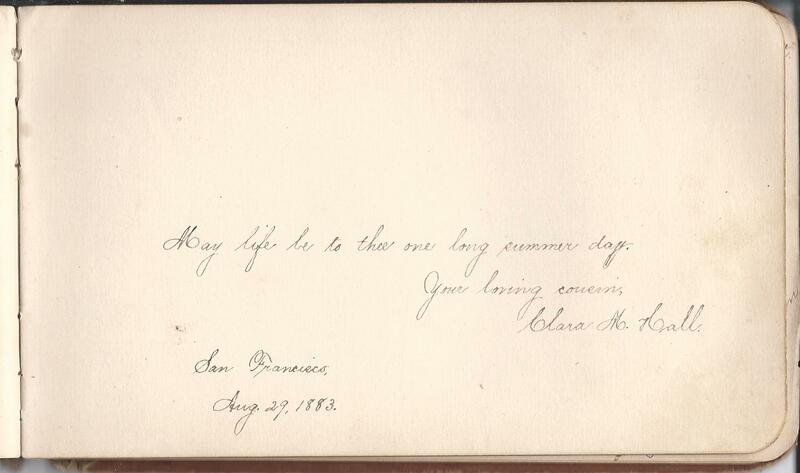 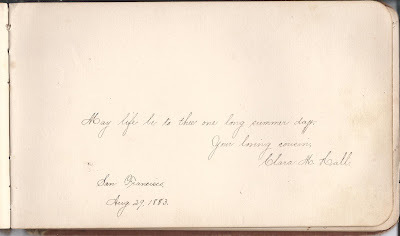 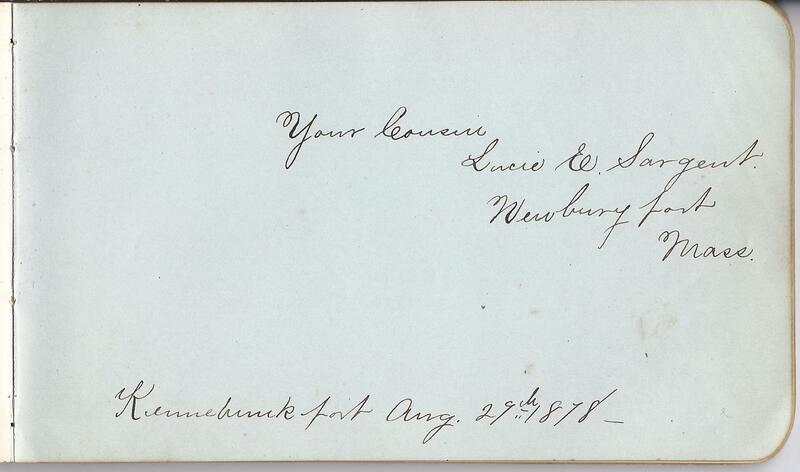 1870s/1880s autograph album of Alice F. Robinson of Kennebunkport, Maine, and Lawrence, Massachusetts. 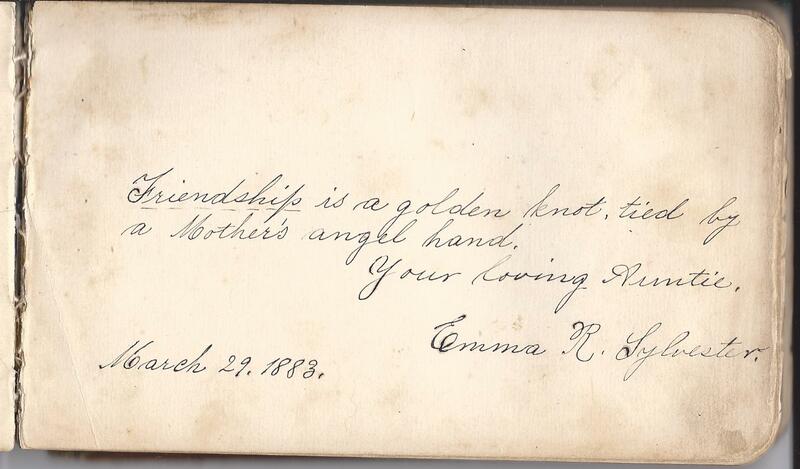 A slideshow of images of the entire album, in page order, appears at the end of this post. 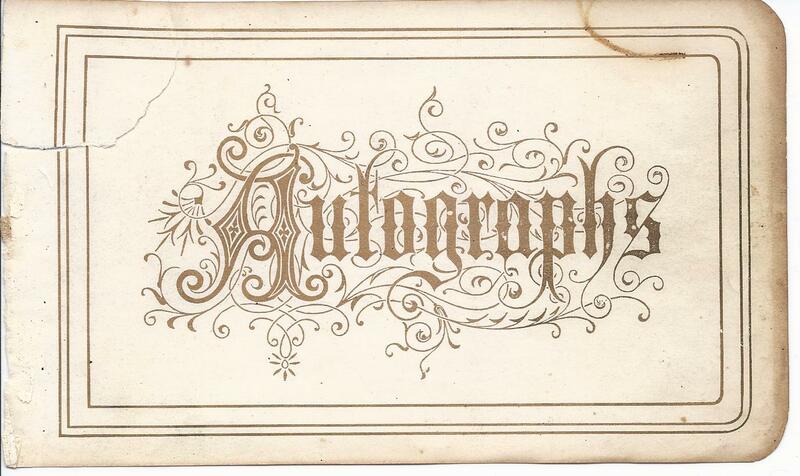 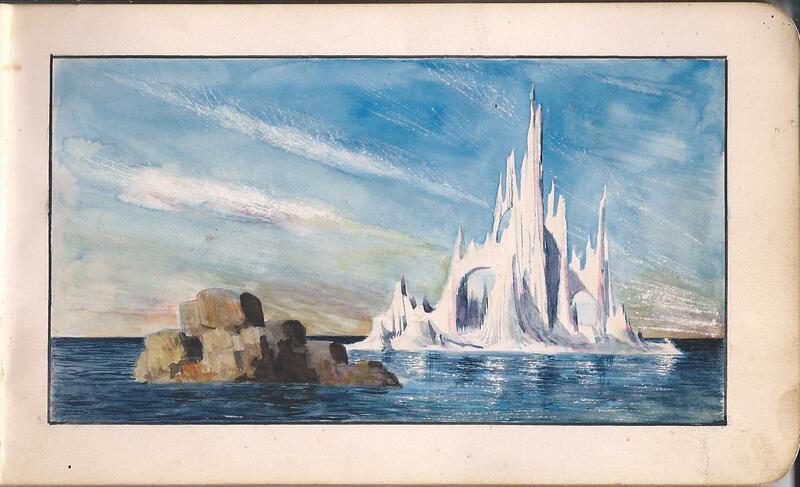 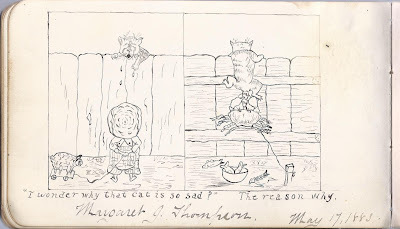 The album is approximately 6-3/4" x 4-1/2" and contains 76 autographs of relatives, friends and teachers, as well as two wonderful illustrations, one of a painted arctic scene and the other of a very cute rendition of a cat's predicament. 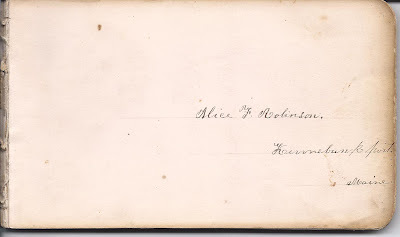 Alice was born 15 March 1866 at Newburyport, Massachusetts, the daughter of Charles E. Robinson and Betsy Anna (Wildes) Robinson. 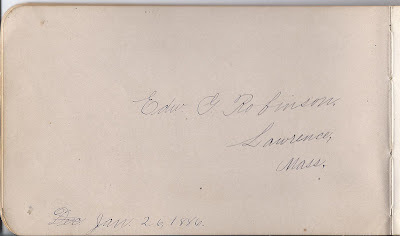 The family later lived at Kennebunkport, Maine, and, later still, at Lawrence, Massachusetts. 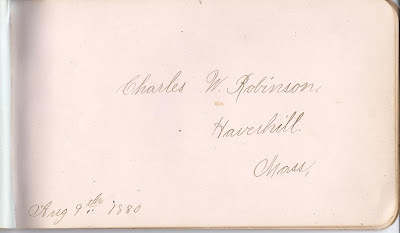 From what I could determine online, hopefully correct, Alice's paternal grandparents were Samuel and Elizabeth Ann (Hussey) Robinson. 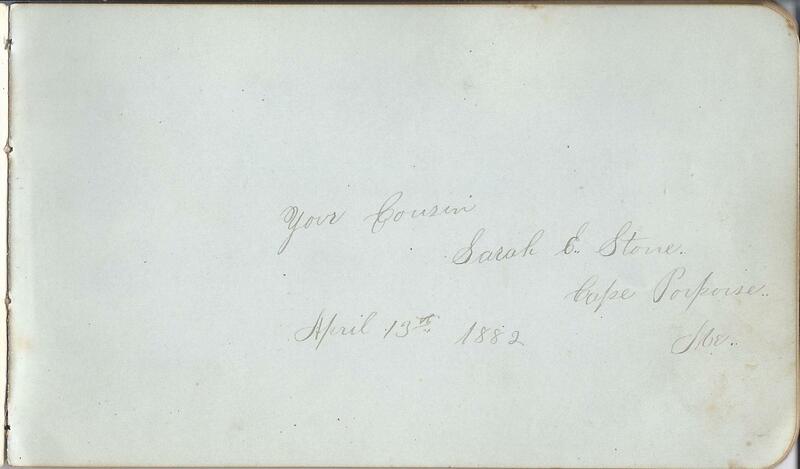 Her maternal grandparents were Samuel and, possibly, Olive, Wildes. 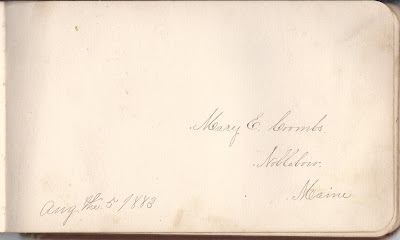 Alice was married at Lawrence, Massachusetts on 23 December 1892, to Charles William Malonzo, born about 1868 in New Hampshire. 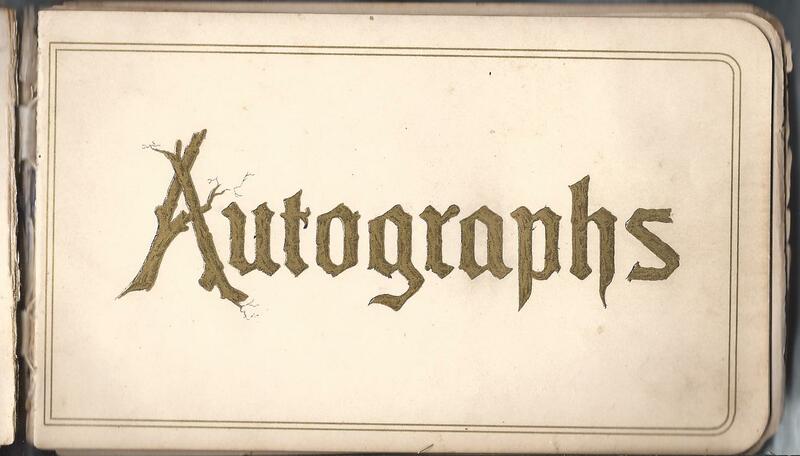 Among the many autographs in the album are those of Alice's father, brother, sisters, cousins and her future husband. 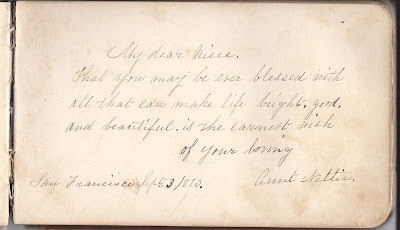 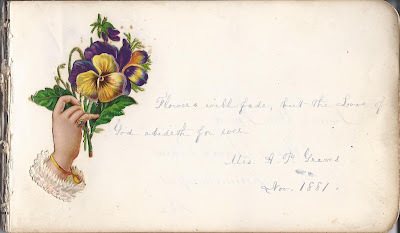 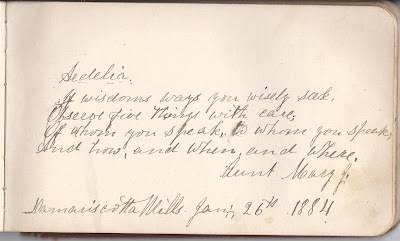 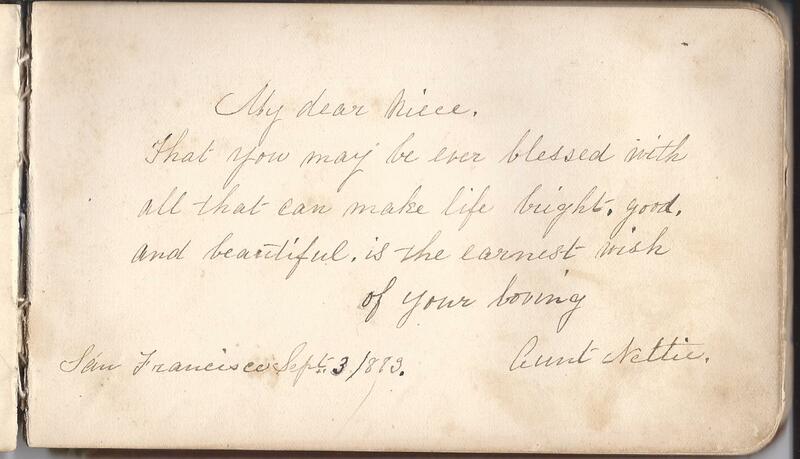 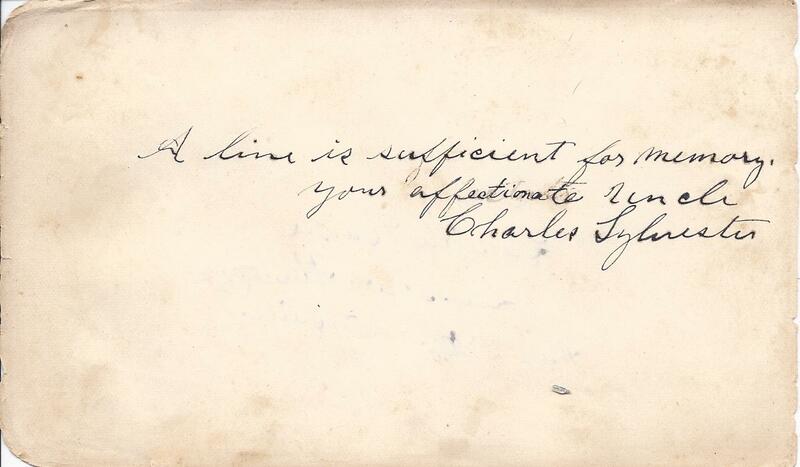 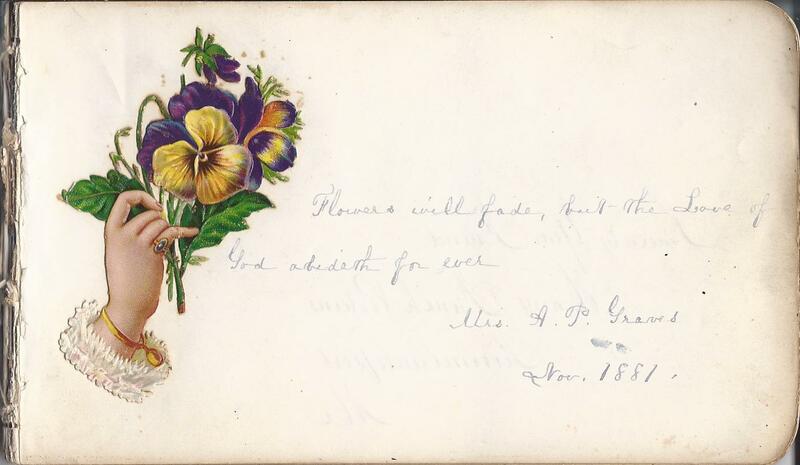 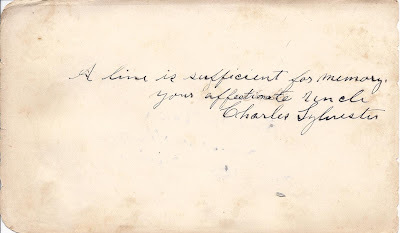 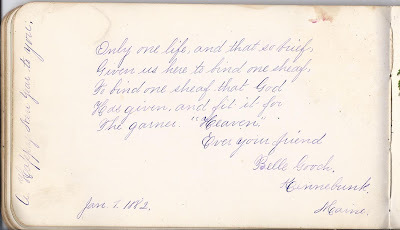 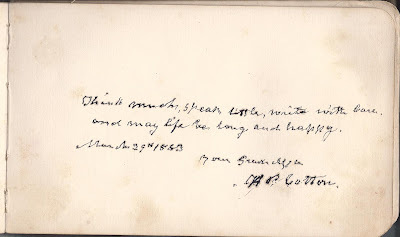 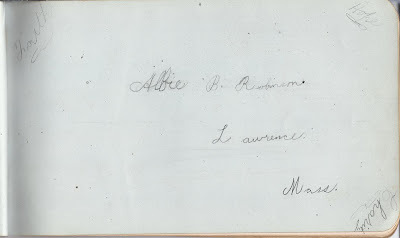 Alice's future husband Charles W. Malonzo signed in 1891 on a page shared with three others. 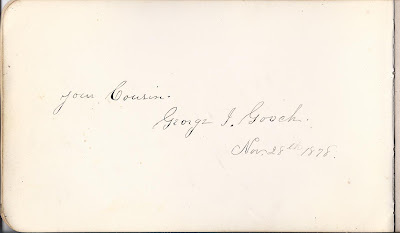 Two other people named Gooch signed pages in the album. 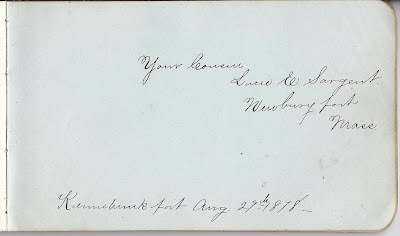 Other Sargents who signed were C. H. Sargent, C. R. Sargent and Sam E. Sargent; the latter two gave their address as Newburyport, Massachusetts. 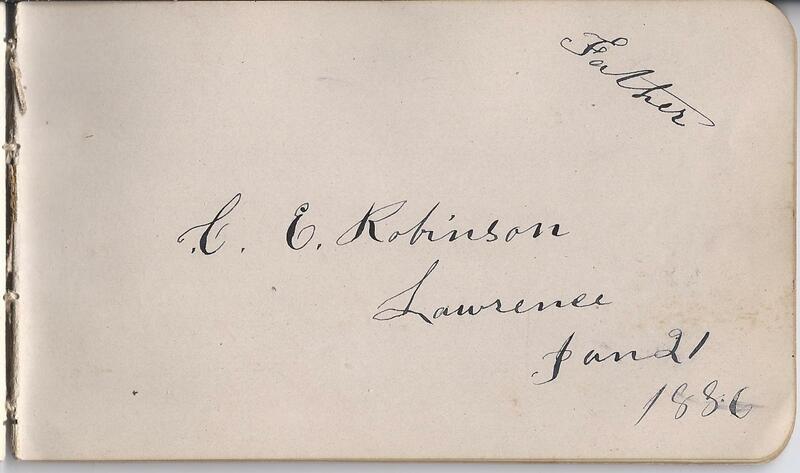 They signed in 1878 and 1879. 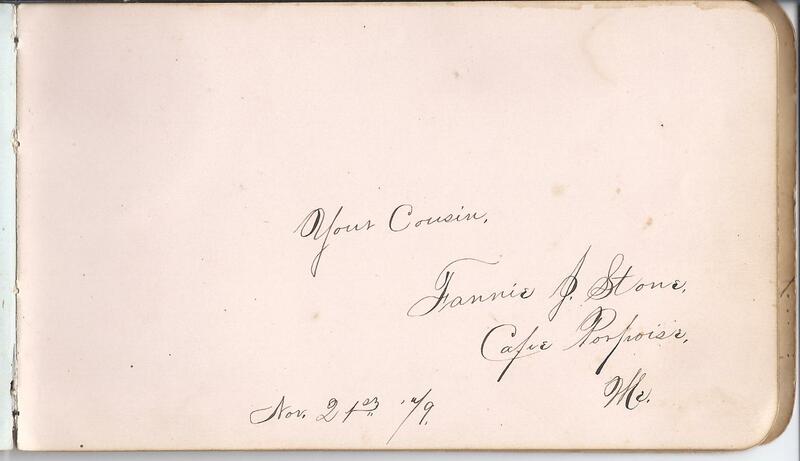 Alice's cousins Fannie J. 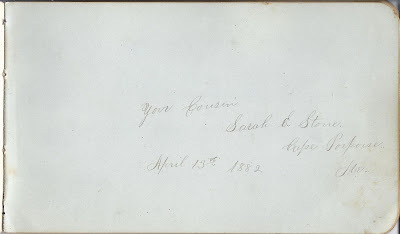 Stone and Sarah E. Stone of Cape Porpoise, Maine, signed pages in 1879 and 1882 respectively. 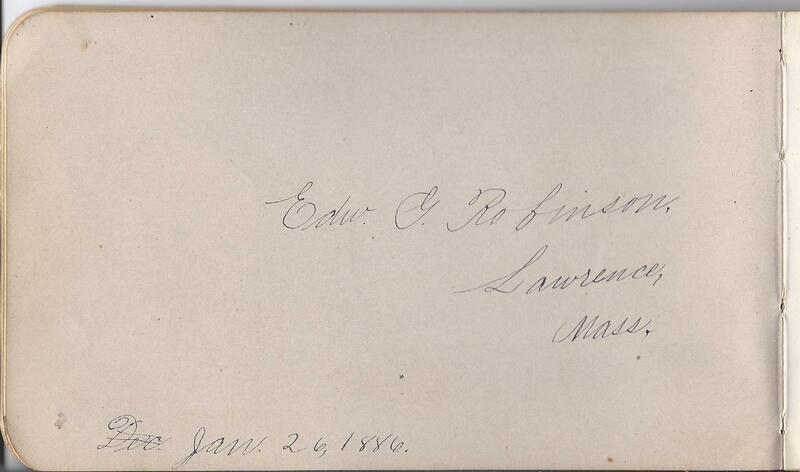 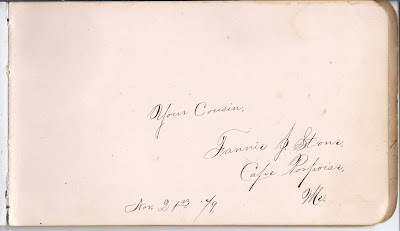 Other people named Stone who signed pages were Mr. C. L. Stone of Cape Porpoise, Maine; Mrs. C. L. Stone of Cape Porpoise, Maine; and F. G. Stone of Kennebunkport, Maine. 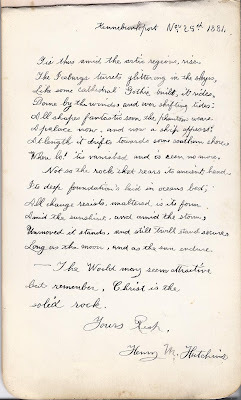 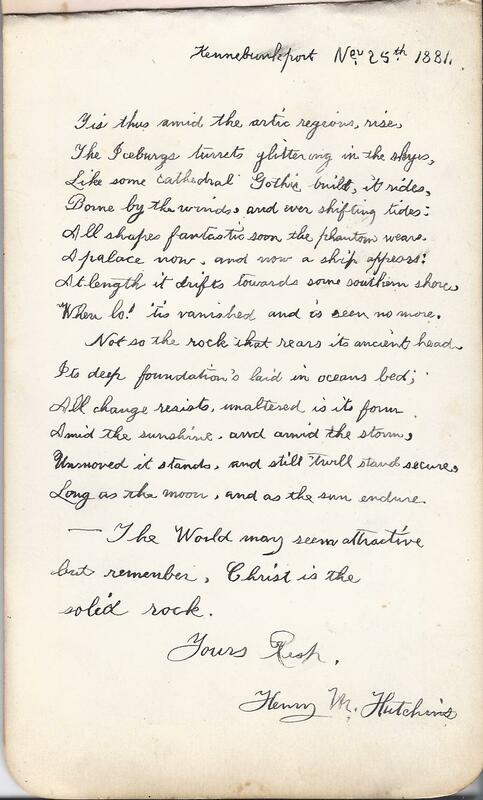 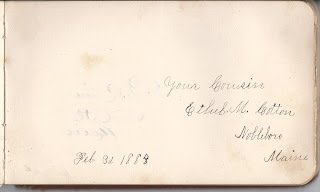 Mr. and Mrs. Stone signed their pages in 1882. 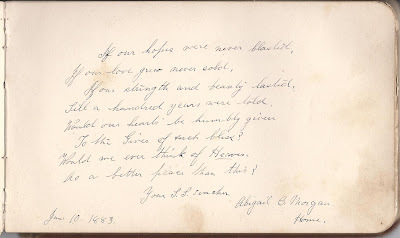 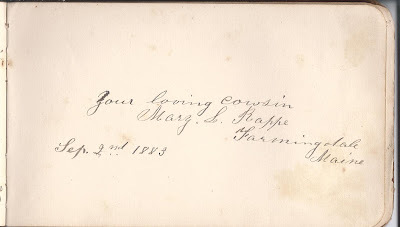 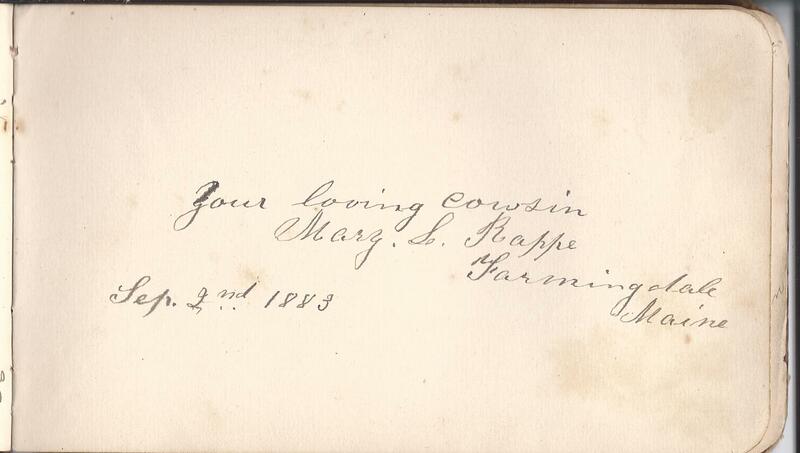 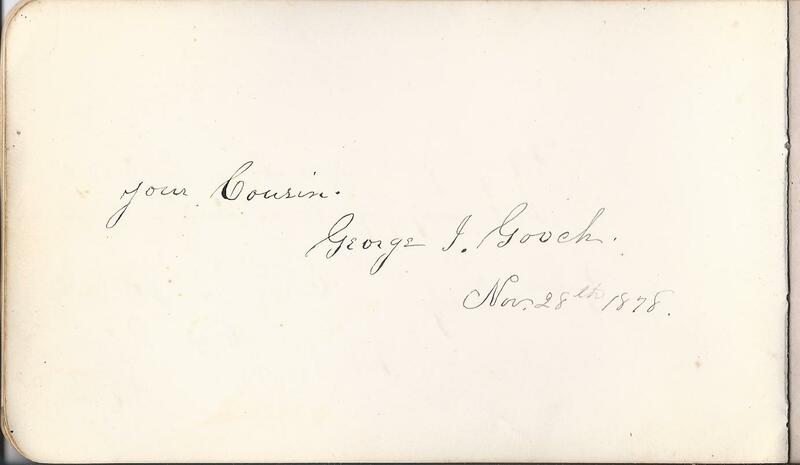 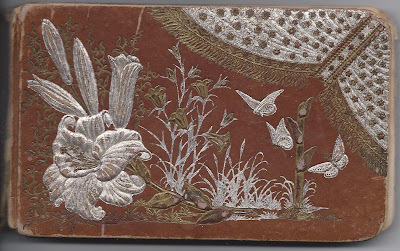 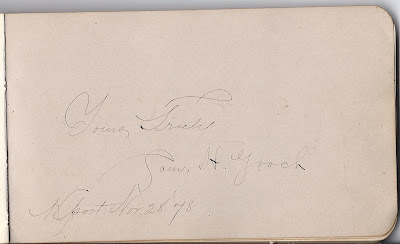 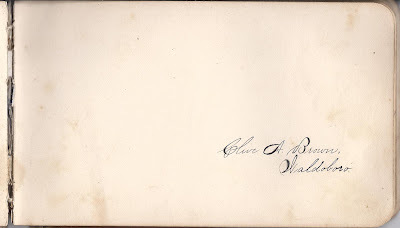 F. G. Stone shared a page with Evelyn P. Titcomb and signed in 1880. 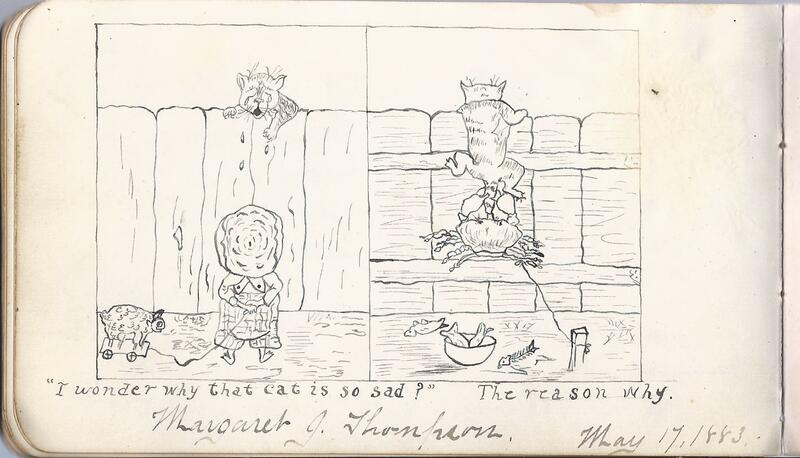 Two people made wonderful illustrations in Alice's album. 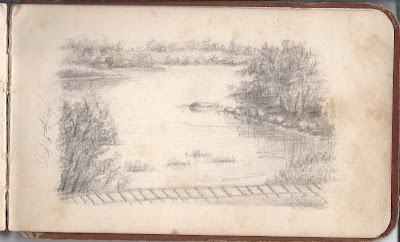 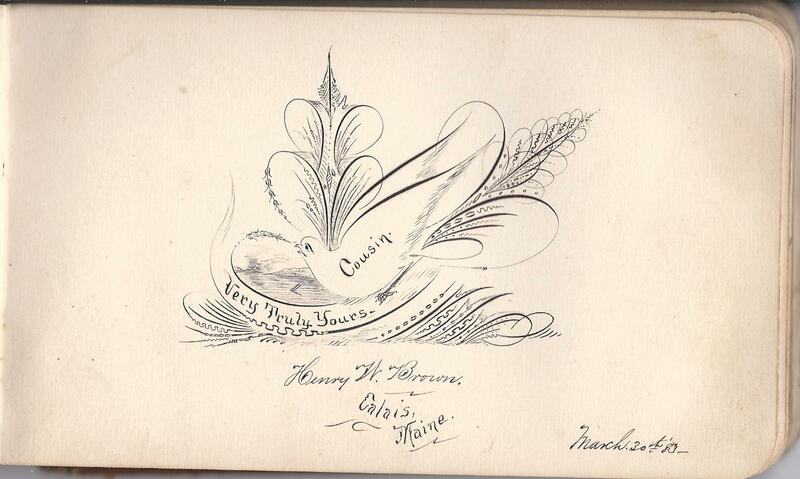 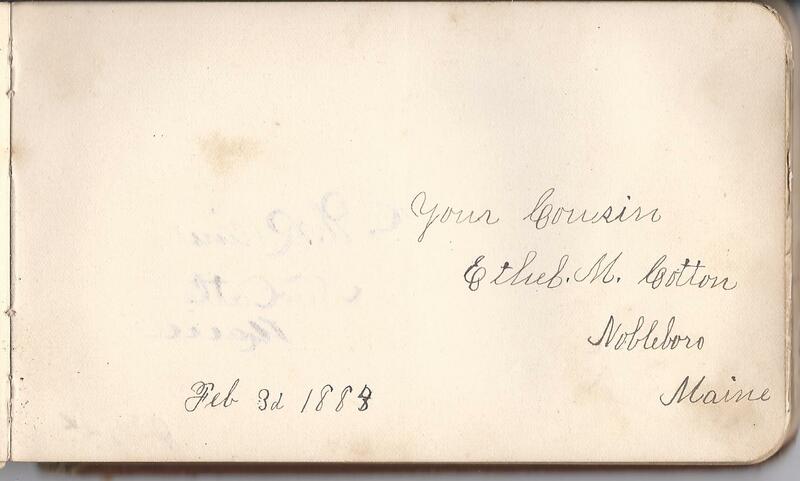 Henry M. Hutchins signed a page at Kennebunkport, Maine, in 1881. I assume Henry M. Hutchins painted this northern scene, which is on the facing page to his page above. 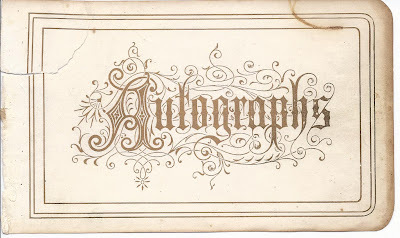 Complete list of signers, in alphabetical order. 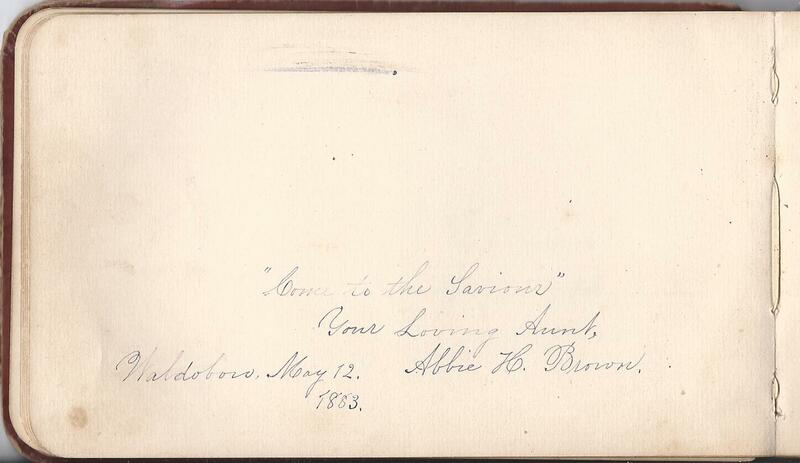 Please note that people who indicated towns may have been referring to the town where they signed a page in the Alice's album, rather than their actual home town. 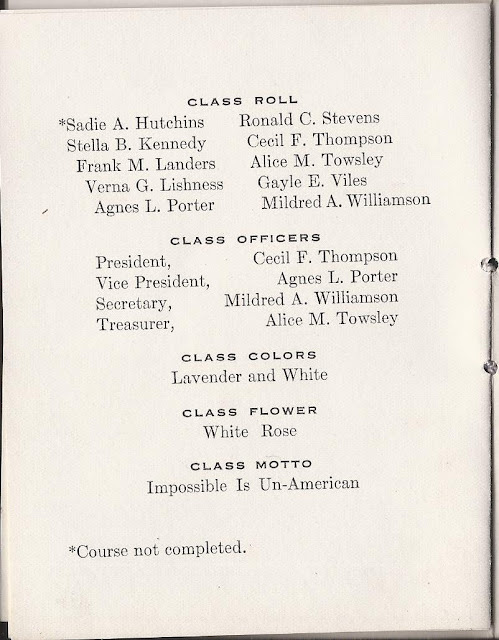 If you have any information on any of the people mentioned above, please leave a comment or contact me directly. 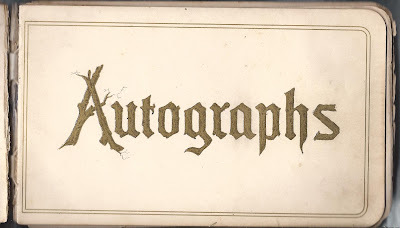 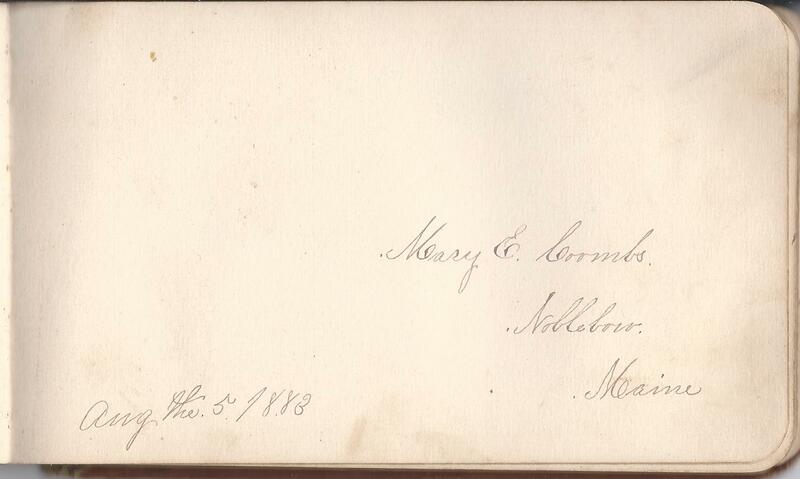 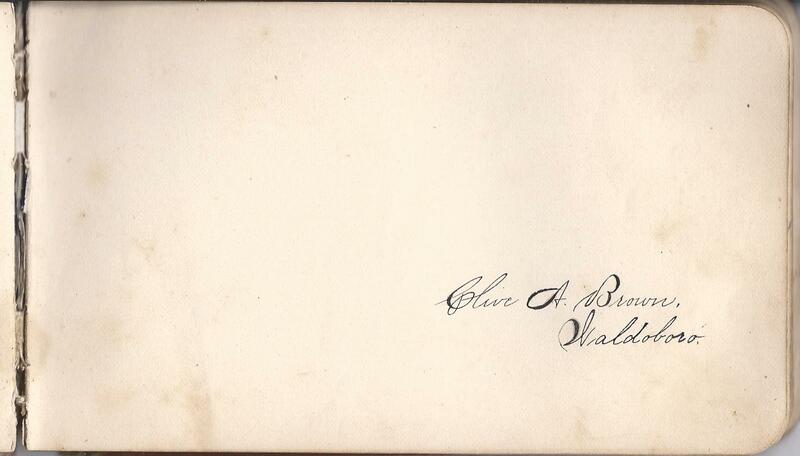 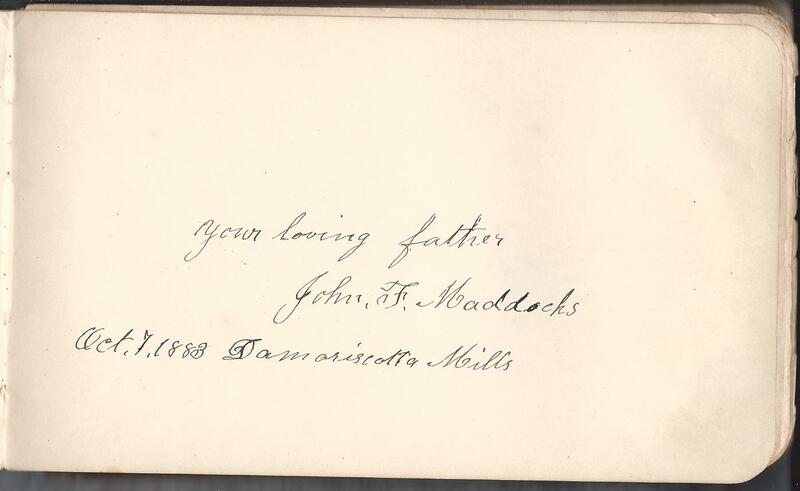 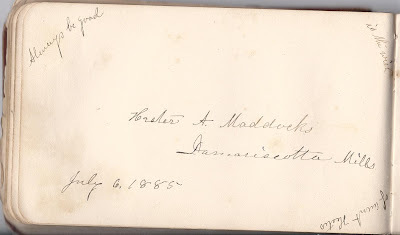 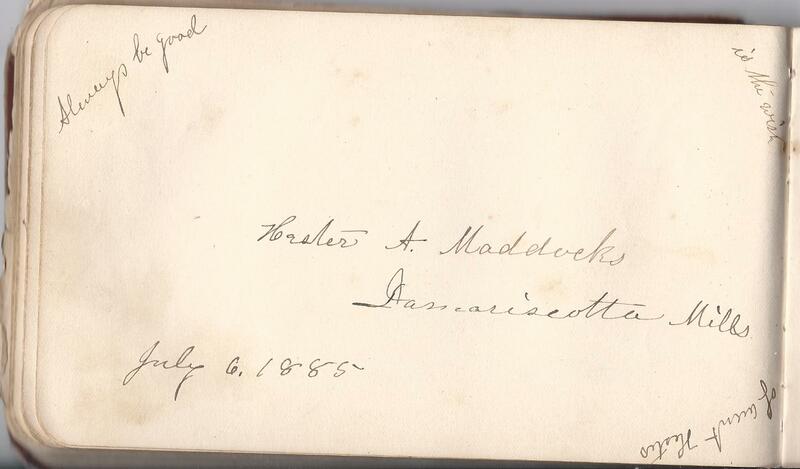 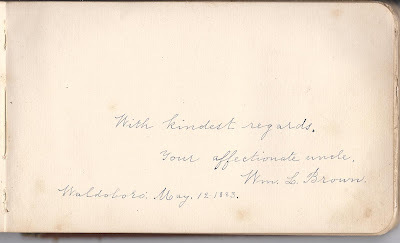 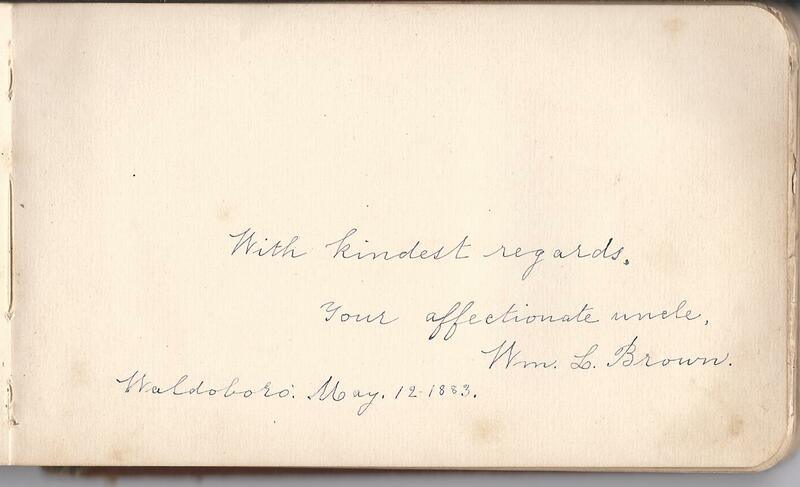 1880s autograph album of Ardelia M. Maddocks of Nobleboro, Maine. 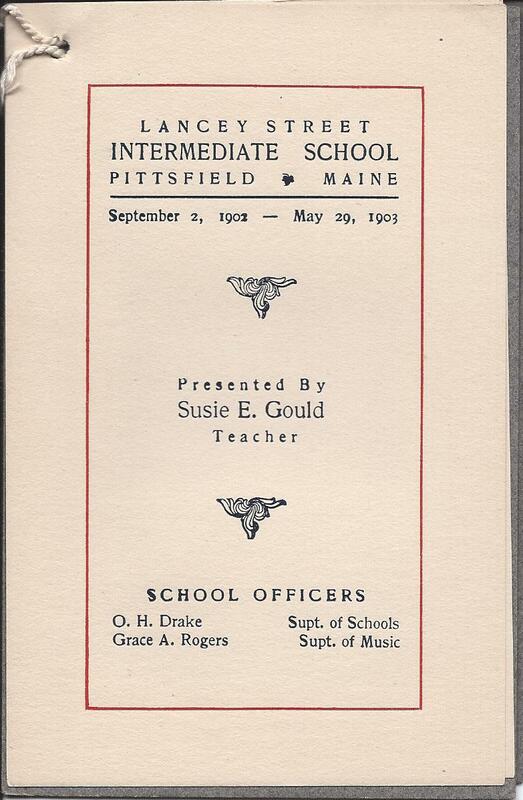 From clues inside, the album appears to have been used by Ardelia during her time at Lincoln Academy. 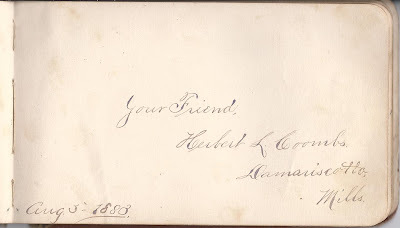 Later on, Ardelia married Herbert L. Coombs, and they raised at least one son,Frank, at Nobleboro, Maine. 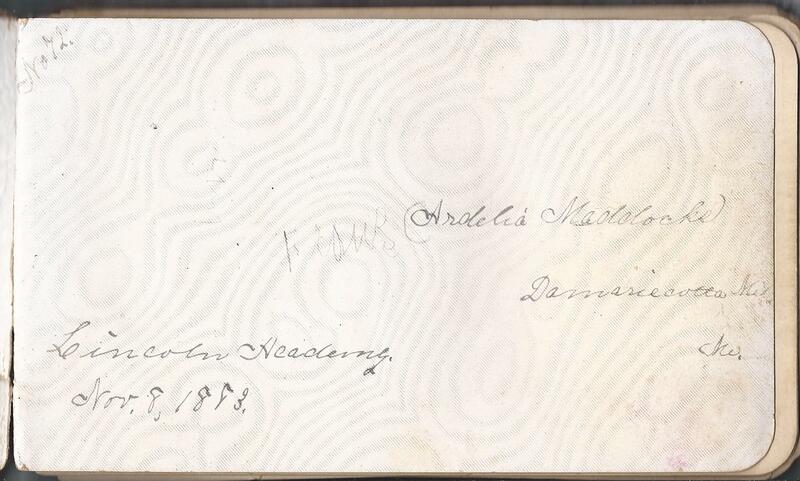 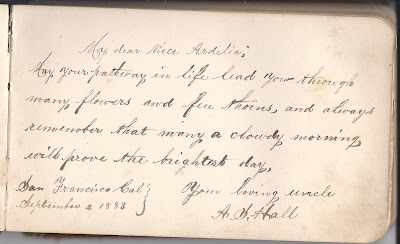 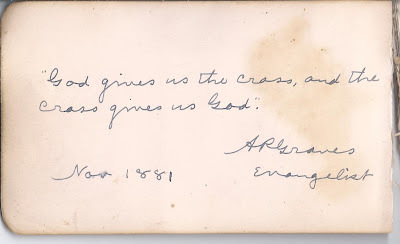 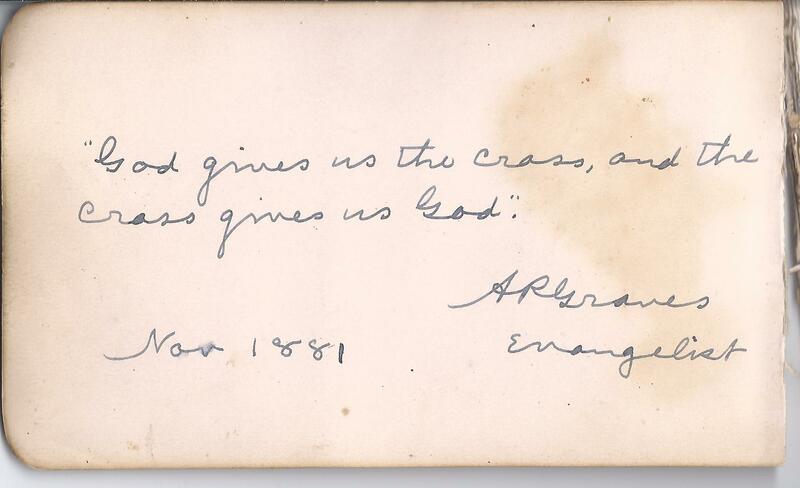 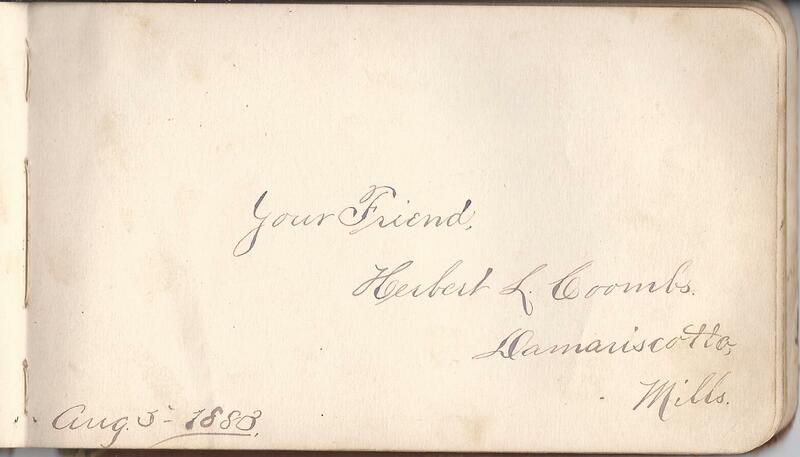 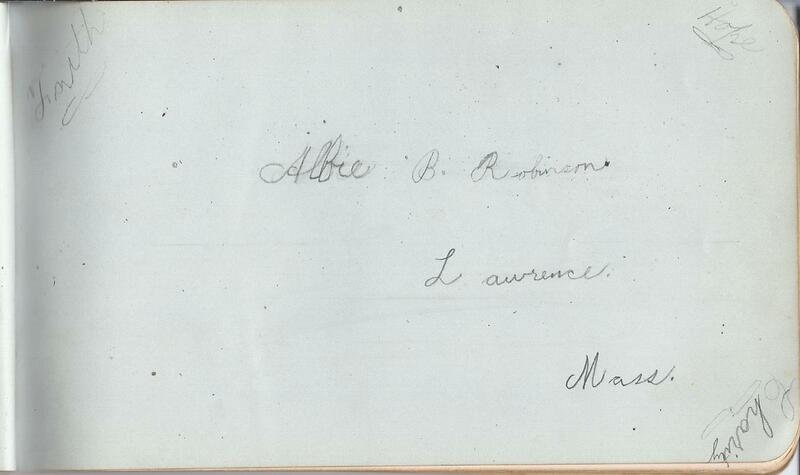 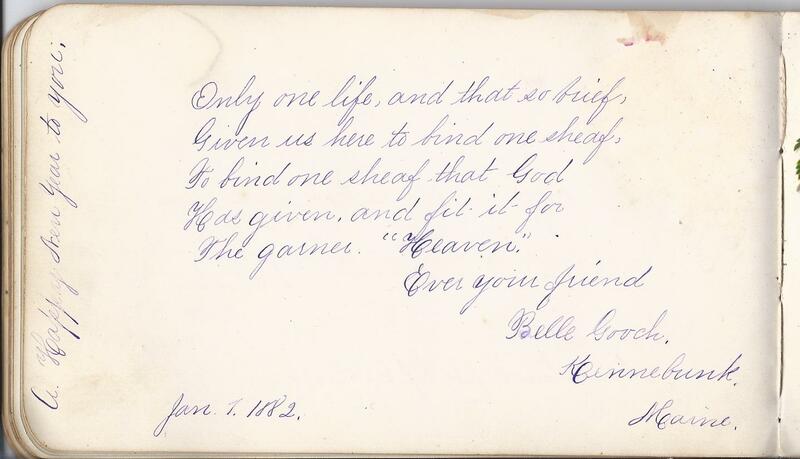 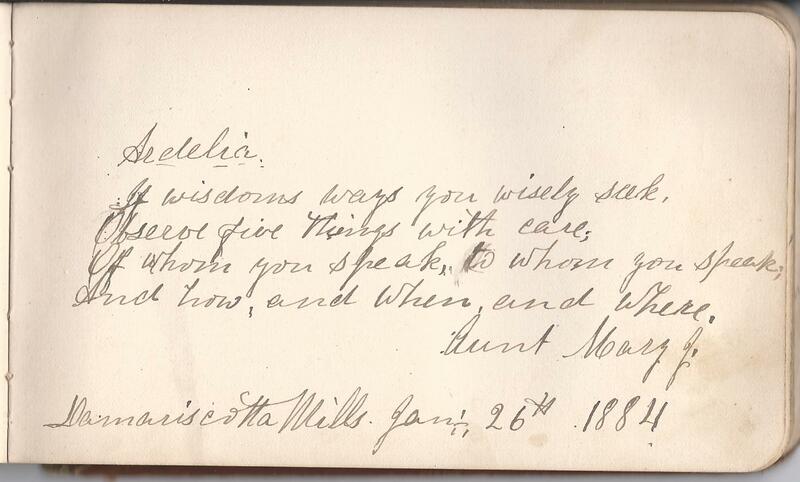 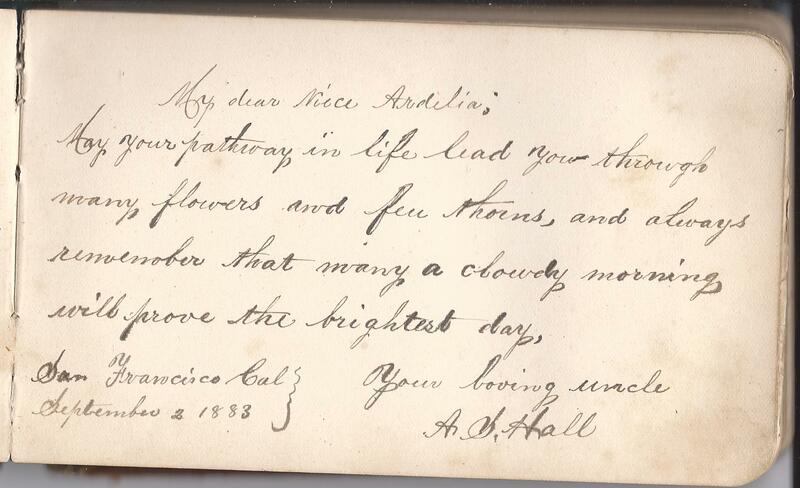 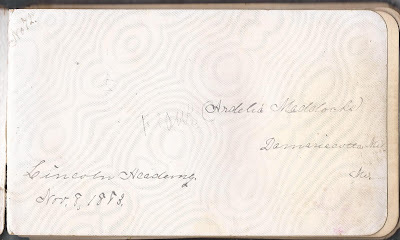 Herbert signed Ardelia's page in 1883, when they were young friends, see below. 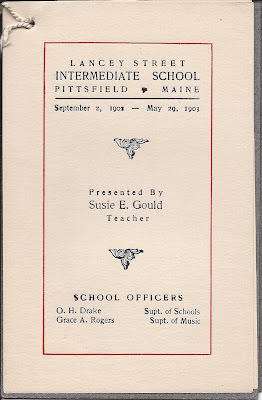 Lincoln Academy, chartered in 1801, still exists today, as a private academy that also serves as a public high school for area towns. 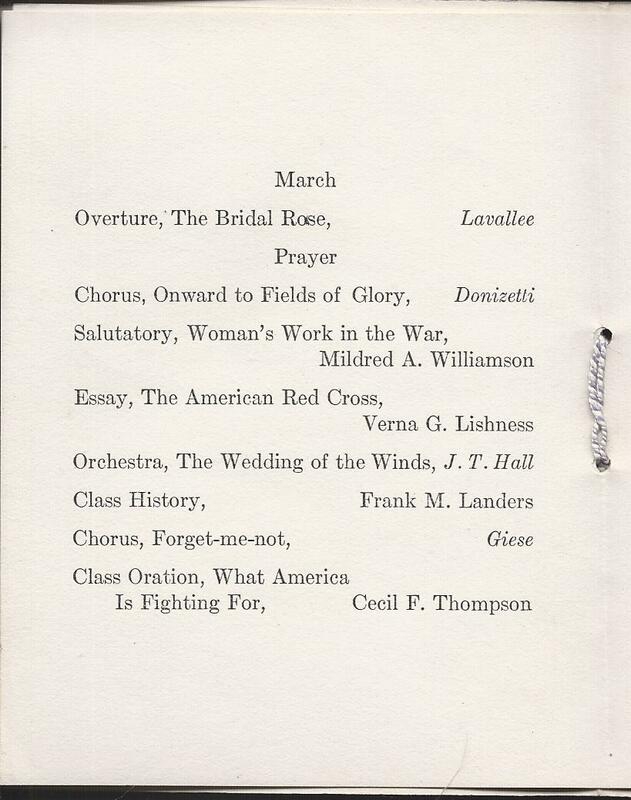 The Academy's website lists class lists for the 1880s; the lists are incomplete. 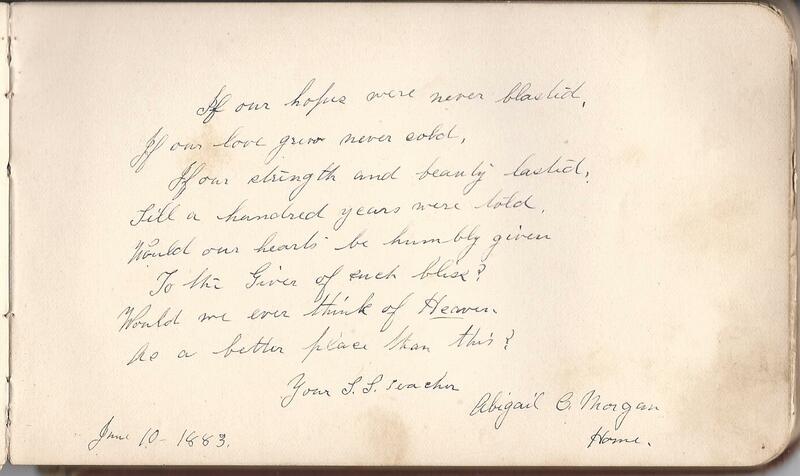 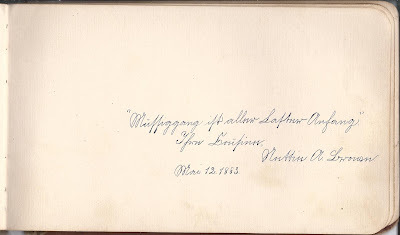 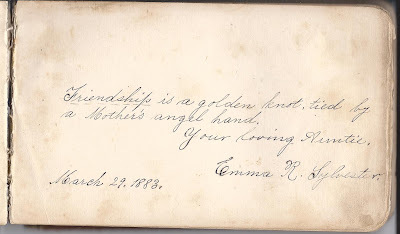 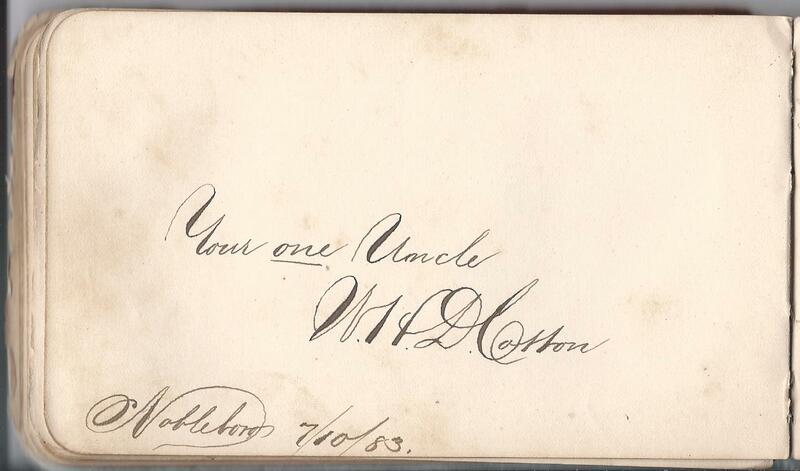 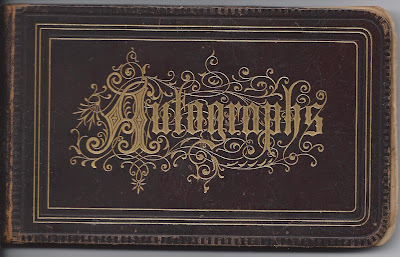 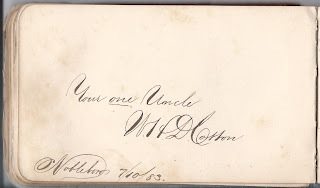 An earlier post entitled 1880s/90s Autograph Album of Miss Cotton of Nobleboro, Maine featured an album owned by Ardelia's mother or an aunt, daughters of Henry P. and Emeline (Seiders) Cotton of Nobleboro, Maine, born in New Hampshire and Maine respectively. 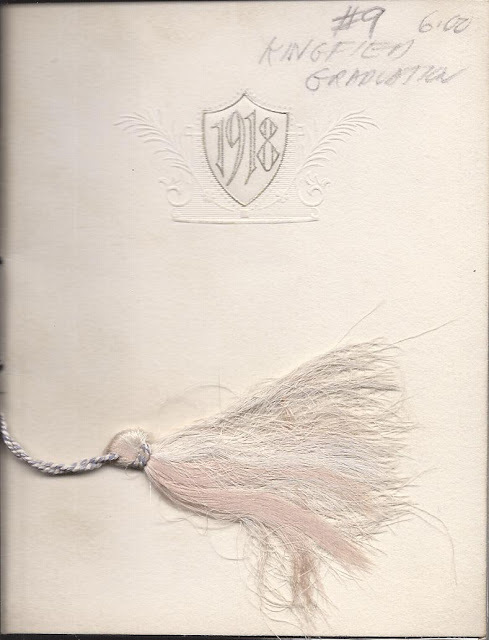 The albums were discovered separately. 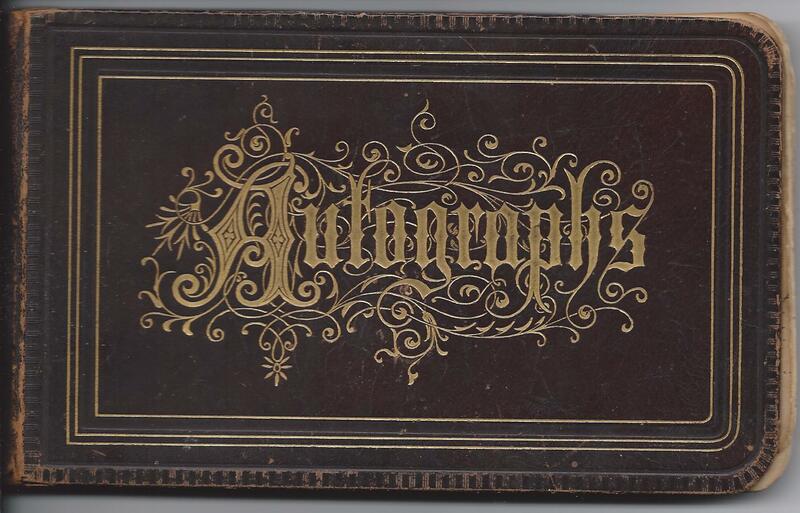 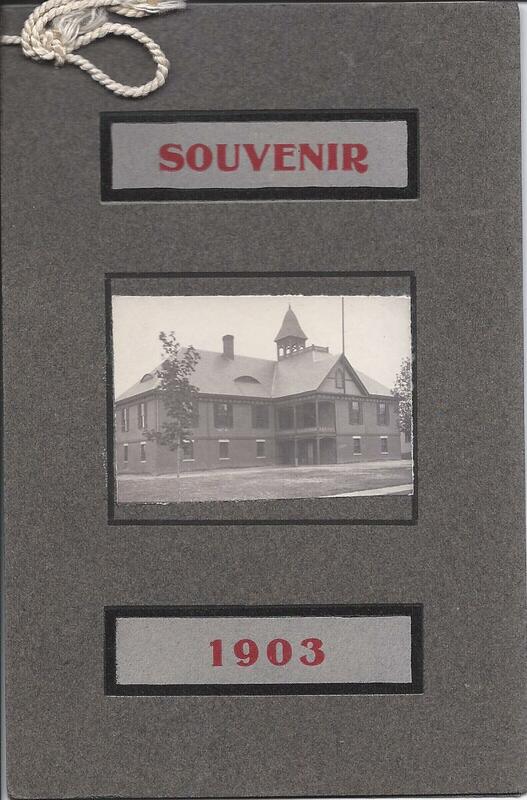 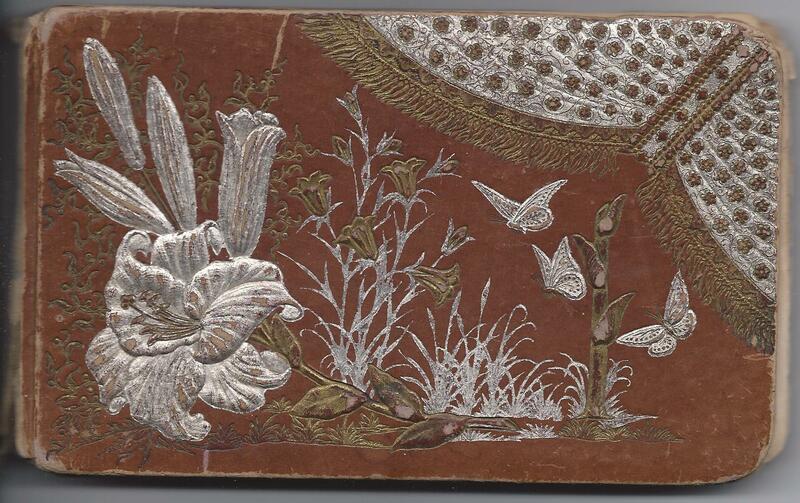 Ardelia's album measures approximately 7" x 4-1/4" and contains 77 autographs of relatives and friends. 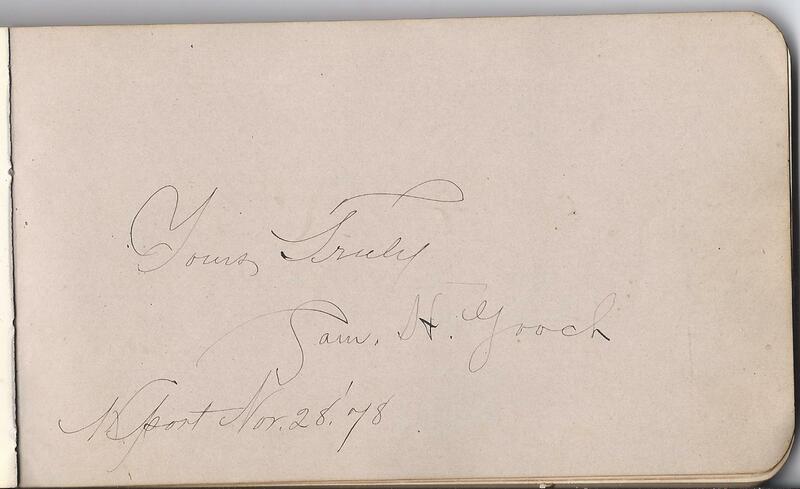 A page signed by someone whose name I can't decipher. 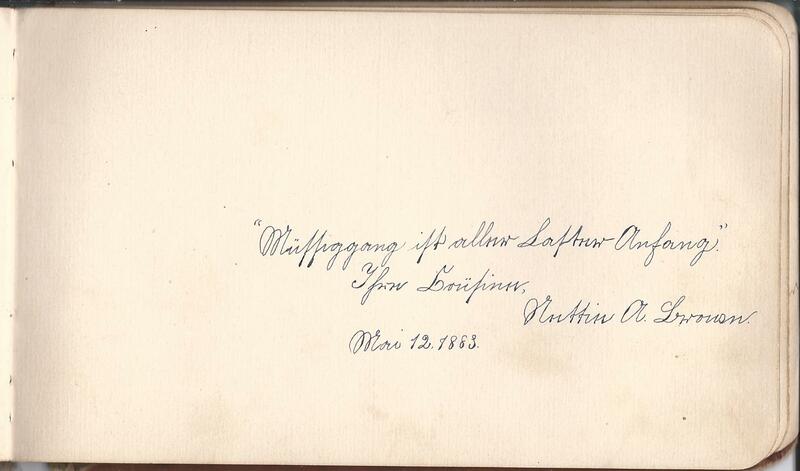 It's perhaps German. 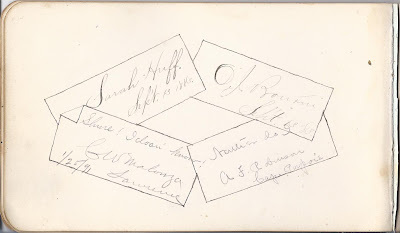 Complete list of signers, in alphabetical order, below. 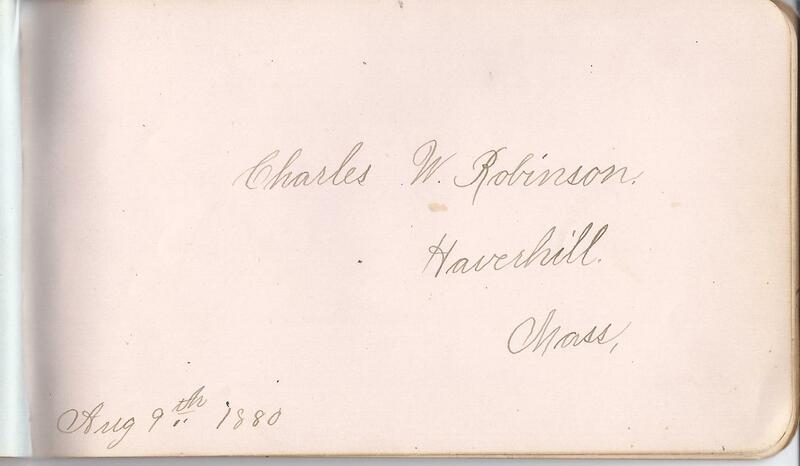 Please note that the towns mentioned by some of the signers may have been where they were when they signed rather than their home town. 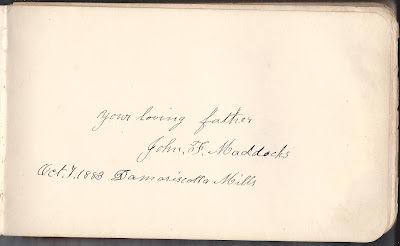 If you have any insights into the Maddocks or Cotton families, or any of the other people listed in this post, please leave a comment or contact me directly. 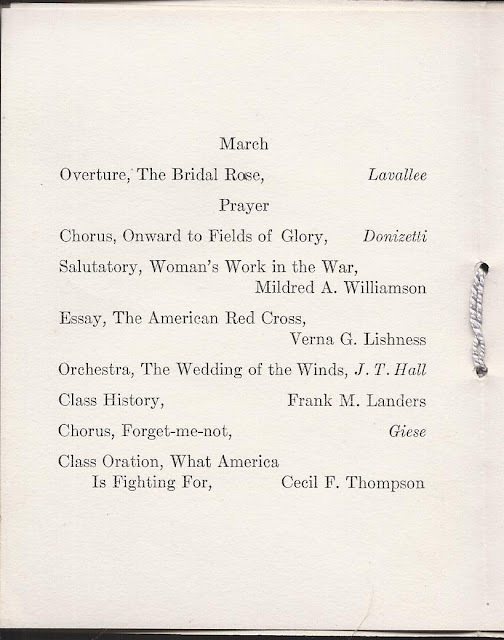 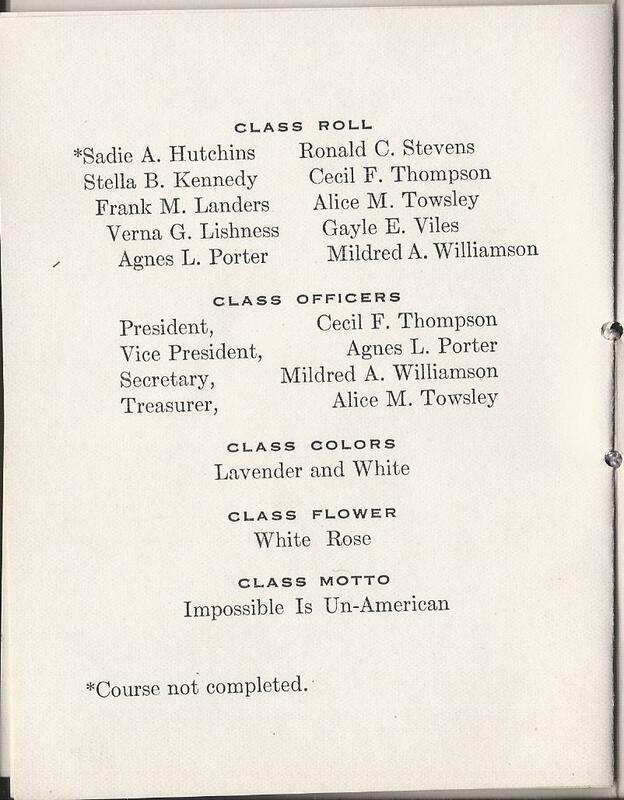 Program of the Graduating Exercises of Kingfield High School, June 27, 1918, Kingfield, Maine. 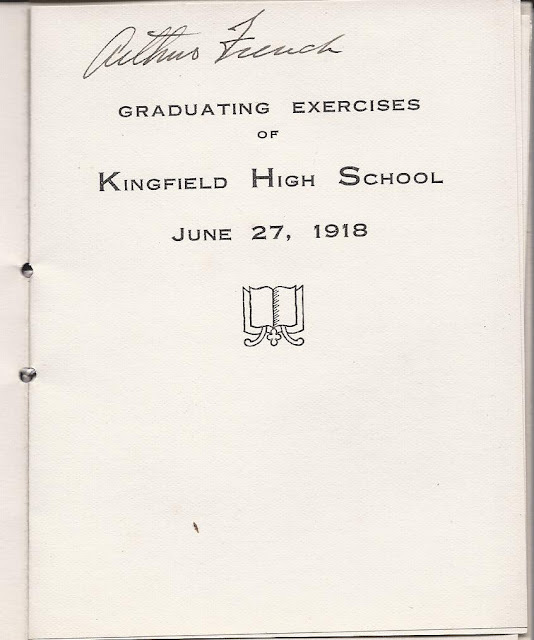 The program has the handwritten name of Arthur French; he was not among the graduates but was perhaps an official or guest.